A common concern of prospective students is that music programs are being cut from schools and there is no future for music teachers. But this could not be further from the truth, says Dr. Angela Park, under whom the Conservatory’s music education program has grown steadily in recent years. Park points to the research that finds a shortage of music teachers in America. The California Music Educators Association (CMEA), for example, has reported that it is working with the California Department of Education to help address a projected need for 100,000 new teachers in the state over the next five years. “California will need to recruit out-of-state teachers in the field of music education, as well as provide clear, concise information necessary to facilitate ease of access to the requirements necessary for completing the Single Subject Credential in Music,” a recent CMEA report said. The need for music teachers nationwide is, of course, greater and offers an abundance of opportunity for prospective teachers who are willing to relocate upon receiving the credential. The music education department has worked to tap into all resources in order to find graduates music teaching positions. Since Dr. Park began to chair the department, graduates who sought music-teaching positions have found work in the field. Former students now in the field describe their teaching positions with excitement and vision, as each seeks to be light in the world. To live up to Biola’s mission statement “to impact the world for the Lord Jesus Christ,” Dr. Park provides each student with a variety of socioeconomic experiences. Students work with children who come from diverse backgrounds — from homes with unemployed parents to homes in which money is not a major concern. Providing field experiences as early as possible and throughout the program. Students must observe real live music classrooms in local K–12 schools, beginning with their first semester in the music education program. This initial interaction either helps a student to realize that teaching music may not be a good fit, or it confirms a student’s desire to continue in the program. “It’s very practical,” Park said. “The last thing we want is to have a student find out halfway through the program that teaching is not for him or her.” These field experiences continue throughout the program and provide a variety of hands-on learning opportunities. Providing opportunities to work with diverse groups and populations. Students may work with first-graders on Orff instruments, tune fifth-graders’ violins, coach a middle school clarinet section, or lead warm-ups for a high school choir. Placements for student field hours are intentional and allow the music education students to work with different socioeconomic communities. Finally, through contact with various students with special needs, the prospective teacher learns how to teach those who may require an alternate method of teaching, such as English learners, the visually impaired, and autistic children. Equipping students academically in both music and education. who solely hones his or her teaching skills, music education students must be excellent in both areas. Through the Conservatory, a student develops a foundation as a solid musician, taking core courses such as music theory, sight singing, music history, lessons on a primary instrument, and ensembles. Education courses shape the future teacher touching on topics such as the psychological development of children, methods for teaching language learners, and curriculum building. Preparing the future music teacher. The journey to becoming a music teacher is constant throughout the program. Students observe and assist in the music classroom almost every semester. Toward the end of the program, students are given increased responsibility as music leaders through two experiences. The first is a senior music education recital. 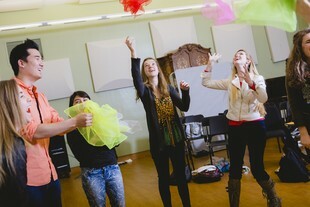 As a culminating project of the degree program, music education students are required to perform on their main instrument and direct an ensemble. Just like a school music director, the student must choose repertoire, organize rehearsals, and successfully lead an ensemble in performance. Another invaluable experience comes shortly after the recital. Student teaching gives the music education student the opportunity to shadow top master teachers in the field. The student observes and eventually teaches at the podium under the watchful eyes of two different master teachers. This type of training is the closest to a real teaching situation that the student will ever receive. Dr. Park’s overall vision for the Conservatory Music Education Department is to encourage those who may be considering music education as their major subject of study to explore the benefits and rewards of the profession. I am glad to hear that the music department is acknowledging elementary music as a career now. When I attended it felt like my choices were as a music major to be a secondary band director or a pro clarinetist. I have been an elementary music specialist since 2002 for Newport-Mesa USD and have seen many Vanguard students observe and help in my classroom. I'm a bit far, but Biola students are always welcome in my classroom. I teach orchestra and general music for k-6. I hope to possibly see some Biola students at OC Orff workshops as well (there is one this Saturday from 9 to 3 at the Orange County Dept of Ed).